Women are intimately connected to the rhythms and cycles of the earth, and in The Way of the Happy Woman: Living the Best Year of Your Life, author Sara Avant Stover shows how simple, natural, and refreshingly accessible practices can minimize stress and put us back in sync with our own cycles and those of nature. In the following excerpt, she offers advice for how we can make the most of the summer season. Bare feet, watermelon, sunburns, and sipping Chardonnay on the deck under the stars: all reflect summer’s freedom, joy, and playfulness. On June 21 in the northern hemisphere (and on December 21 in the southern), the summer solstice burns brightly as the longest day of the year — so bright that in northern lands such as Alaska and Scandinavia, the sun never even sets that evening. From this point onward, the sun’s yang energy slowly wanes, as do the daylight hours, until we reach the darkest point in the yearly spectrum, the winter solstice. The impermanence of this bright day signifies the earth’s biggest inhalation of the year and reminds us to celebrate and relish all of life’s pleasures by drinking them into every cell of our bodies. Just as a child savors each day of her summer vacation, counting down the days until her return to school, we also must become more present and more attuned to the warmth, colorfulness, fecundity, and juiciness of this season through even the simplest of pleasures. It’s time to partake in nature’s flourishing and to celebrate all the ways in which our lives are blossoming too. The ancient Chinese celebrated the earth, the feminine, and the yin forces on summer’s arrival. Ancient pagans honored midsummer with bonfires; Swedes decorated a midsummer tree to dance around in a magical ritual intended to bring rain. Caribbean pirates believed a ship could sail off the world and into the sun on that day, and Native Americans have created countless stone structures linked to equinoxes and solstices, the most famous being Wyoming’s Bighorn Medicine Wheel. Make it a priority to enjoy summer’s delicacies as you go about your life. Enjoy walks in the morning air, yoga outdoors, lunches in the park, moments to watch the sun rise or set, bike rides through the country, candlelit dinners on the deck, or afternoons spent swimming and sunning at the beach or pool. Even indulging in quick snapshots of summer can do it: sip a fresh juice, sunbathe on the roof during your lunch break, or wear a bright flower in your hair to work. The season invites us to bring more enthusiasm, warmth, extroversion, and joy into our daily lives, to be as energetic as children. We can stay up late and wake up early, like the sun. We can splash in swimming holes or nap under the shaded canopy of a big tree to escape midafternoon heat. We can bite into a ripe mango or a juicy peach. This season’s warm temperatures allow for some great moon practices. On the full moon, get naked, wrap yourself in a big blanket, and at night privately slip outside onto your roof or into your backyard. If your house isn’t private enough, get together with a girlfriend who has a more secluded space to do this. Lie down on the earth, your back on the blanket. Drink the moonlight into your body. Bathe in it. Pray to the moon for any healing of your body, sexuality, or femininity that you need right now. If there’s some water nearby, go for a moonlit skinny-dip. During your menstrual cycle in the summer (and year-round), use organic cloth menstrual pads (I like www.PartyPantsPads.com; they’re much friendlier to the environment and your body than the disposable ones) most of the time and organic tampons when you are going to the beach or want to go swimming. Pads allow the downward flow of your menstrual blood to remain uninterrupted, so they’re the best option. I know it might sound a little far-out for many of you, but, ideally, each day you should soak your soiled menstrual pads in a large jar that’s filled with cold water. Then, at the end of the day, wash the pads in the washing machine with cold water, and feed your favorite plant or tree the water from the jar. Why on earth would you want to do that, you might ask? Well, menstrual blood hasn’t always been seen as dirty or gross. Our ancestors thought menstrual blood to be very rejuvenating and fertilizing, and in ancient times, women sat on the earth in red tents and moon lodges, bleeding directly into the ground beneath them. Some of my women friends involve their daughters in this ritual each month to teach them how to revere, rather than hide, their menstrual blood. I first learned this when I spent the summer at one of my teacher’s ashrams in the Pyrenees of southern France. She mentioned this ancient wisdom, and, since I was camping at the time, I had plenty of opportunities to squat on the earth and release my menstrual blood. Because my mind was so quiet during those months due to a lot of yoga and meditation practices (and living in such intimacy with the elements), I could hear the earth — and my inner wisdom — speaking to me, telling me how much she needed women to remember our bond with her. We don’t need to keep our menstrual blood so neat and tidy. Sure, we need to be practical and use some discretion at times, but simply by pouring your menstrual water back onto nature’s creations, you’re helping to heal a long-lost bond between women and our mother, the earth. Your menstrual blood is purifying and powerful and is never something to be ashamed or afraid of. 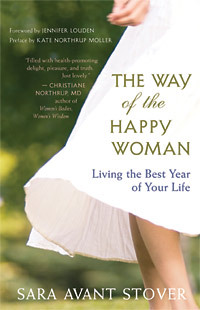 Sara Avant Stover is the author of The Book of SHE and The Way of the Happy Woman. She has been featured in Yoga Journal, Newsweek, and Natural Health and on ABC, NBC, and CBS. Visit her online at www.TheWayOfTheHappyWoman.com. Excerpted from The Way of the Happy Woman. Copyright © 2011 by Sara Avant Stover.